Indigenous leader Evon Peter (featured in THRIVE) is the Vice Chancellor for Rural, Community and Native Education at the University of Alaska Fairbanks. He is Neetsaii Gwich’in and Koyukon (Native American) from Arctic Village, where he served three years as tribal Chief. Evon dedicates his life to indigenous justice. Tune in for his messages about the meaning of success, integrity and manipulation of vulnerable communities. Evon Peter: In my community, you’re perceived as being a successful human being based on how much skill you have developed in living in good relationship with the land and living from the land. It’s based on how much knowledge you’re attaining in your lifetime. You can experience a whole lifetime and not have paid attention to what has happened in that, to yourself and to others, so you’re not gaining that knowledge and then, also, the attainment of wisdom. As you gain more skills, as you gain more knowledge, as you gain more wisdom, you become more successful within my community. Another signifier of success in my community and an indigenous community is your wealth is defined by how much you give, not by how much you take. They say, “Always speak the truth. Always speak from your heart. Never raise your voice against anyone. And in that way, our people will prevail in whatever the path it is.” I think that we don’t project that that means one result or another, but that we will prevail in being who we are as a Gwich’in people and carrying ourselves in the way that we were raised. That is part of the most important thing that we can be doing, despite what happens to our people or to the rest of the species and humanity in the world. In the United States, we generated quite a bit of nuclear waste through the years, a lot of it currently being out in New Mexico, and the industry and the government trying to find a location to store this nuclear waste. And, of course, the places that are most appealing are indigenous reservations. So, you have a similar situation where you have the nuclear industry with the federal government trying to seek out a reservation that is willing to store all the nuclear waste on their reservation lands and offering to pay them millions of dollars a year to allow them to do that. When you look at these things and you look at Hollywood or Berkeley for example, if you had the energy industry coming in and saying, “We’re going to stick a coal-fired power plant down on the corner of University Avenue and Shattuck, it would blow up into a massive resistance. It would never happen. The idea of storing nuclear waste near one of those communities would not even cross the table as a possibility. But, with indigenous communities in this country, it’s the norm. The energy industry is wanting to build a massive power plant they’re calling “Desert Rock” on the Navajo Nation that they say will generate millions of dollars a year for the Navajo Nation Tribal Government. And then the other major development that is being proposed for the Navajo Nation is a military contract to develop missile technology. I’m using these examples because it’s a way I think of how once you stick a community into a place of dependency, then it’s easy to manipulate that community when the need is so great there. You have the Navajo Nation of 300,000 Navajo people living on a land base in Arizona where half the population still doesn’t have telephones or running water or electricity, yet you have it being one of the most massive energy producing places in the whole United States (having been powering California, Los Angeles, Las Vegas, Phoenix for generations now). And you have people having made a tremendous amount of profit off of them (Peabody Coal Company, some of the coal barons of the earlier generations, etc.). So you have a population there that’s basically in a situation where they can be economically blackmailed by these industries and you also have, therefore, the energy industry and the military industrial complex (through the Federal government) sinking deeper teeth and ties into that community so it makes it more difficult for communities to really resist and make transitions that are healthy for themselves. When you’re in a situation where you’re struggling day-to-day to make ends meet and to have a healthy survival for your people, funding for healthcare, education, etc., then you’re susceptible to accepting whatever money resources or business opportunities come your way. How do we heal with Indigenous people and with other persecuted populations? What role do these cultures and have in our next phase of evolution? What can be done to prevent these cultures and their values from being completely wiped out? In what ways do indigenous values touch your life? 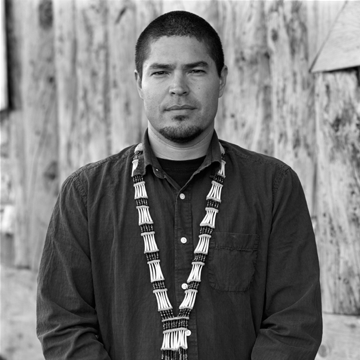 Evon is also the director of The Indigenous Leadership Institute, a non-profit organization that supports young leaders in their quest to create a more sustainable, peaceful world while remaining grounded in their diverse spiritual and traditional backgrounds.